If you own a multi-unit neighborhood community, you may be on the search for the perfect multi-unit neighborhood mailbox choices on the market. You’ll want something durable, but also practical. After all, you don’t want to replace the mailbox unit often. Ideally, you should provide your renters with a secure mailbox so they can feel safe knowing their mail is kept private at all times.So, be sure you choose locking mailboxes when you do decide which option will best fit your renters’ needs. Cluster mailboxes are one of the most commonly used multi-unit mailbox choices on the market. They are available as free standing mailbox units or can often be mounted onto a wall. In addition, there are varieties available for indoor or exterior use. Most often, cluster mailbox units are locked receptacles, with the resident of each unit having a key to access their mailbox alone. 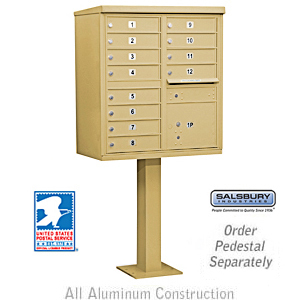 Most often, cluster mailboxes are created from heavy duty aluminum. They come in a variety of colors and sizes. The most common quantities found are 8 door cluster boxes, 12 door cluster boxes, 13 door cluster boxes and 16 door cluster boxes. These mailbox units can also come in horizontal or vertical varieties. The horizontal types are ideal choices for those needing mailbox units for apartments or condos. They have various different sizes you can choose from, in the horizontal design. Vertical cluster mailboxes offer more space for residents, which may be important to property owners. They will often provide enough space for small packages or magazines, as well. Since most cluster mailbox units are rather small, offering only enough space to store regularly sized mail or magazines, parcel lockers are often used in conjunction with the cluster units themselves. These are larger lockers mail delivery personnel can utilize if a resident gets a small package or item they can’t properly fit into the everyday cluster mailbox assigned to the resident. Most often, the mail delivery person will leave a key in the regular mailbox of the resident and the resident will then use the key to retrieve their package from the locker unit. In most cases, the key will then stay in the locker unit until the mail delivery person needs to use it again for a different resident. Sometimes cluster mailbox units will include both regularly sized mailboxes, with a smaller locker at the bottom of the unit itself. If you’re searching for multi-unit neighborhood mailboxes for four or fewer units and need something on the exterior of the residences, you may want to consider mail chests. These mail receptacles are often made of aluminum and often have a front and rear access locking door included. The mail is typically deposited in the access panel on the front, which is not locked. They can also include an outgoing mail tray, a lock and a red signal flag. These chests can be mounted on a pedestal or base, to create charming multi-unit neighborhood mailbox solutions.